Adelaide’s cool coastal suburb of Henley, with its laid-back beach lifestyle has been hot talk recently, with the opening of restaurateur Simon Kardachi’s newest outpost, Melt. Designed by local outfit Studio-Gram, the goal was to deliver a sophisticated ‘beachy fit-out that avoided the clichés of white linen and whitewashed floor boards’. 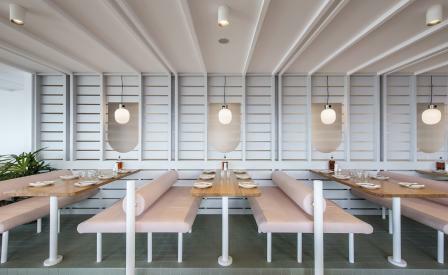 The result is a bright and airy restaurant that pays homage to the south Australian beach culture, to when small shacks once dotted the shorelines, with interior plants – styled by Emma Sadie Thomson – and a muted palette of soft colours and textures. Meanwhile, Kardachi’s signature open-air design allows the gentle sea breeze to drift through, integrating the beautiful surroundings of Henley beach inside. The menu includes 15 signature pizzas, such as the Patatas – topped with crushed potato, truffle, tilsit cheese, wanuts and thyme – as well as fresh daily tapas specials. For dessert, indulge in the ever-popular chocolate and pistachio with Frangelico, or glazed citrus and currant with cinnamon sugar dessert pizzas.